Does Coffee Cause Colon Problems? You drink a cup of coffee and appreciate the effects it has on increasing awareness and energy, but you realize that your digestive system does not react well to coffee. In addition to increasing alertness, coffee has side effects that may cause colon problems. If you are experiencing colon problems from drinking coffee, you may need to reduce your intake or stop drinking coffee altogether. Coffee can have laxative effects on your colon. By increasing the rate of contraction of your colon, coffee ingestion may result in loose stools or diarrhea. If left untreated, diarrhea can lead to poor nutrient absorption, dehydration and electrolyte imbalances. In contrast, if you are constipated, drinking coffee may result in improved bowel movements. If you drink coffee, monitor your bowel movements and reduce your intake if your stools become too loose. Coffee consumption may increase the amount of stomach acid your body produces, resulting in more acid in your stool once it reaches your colon. In addition, coffee causes the stomach to expel food faster, which also results in less-digested food entering your colon. According to H.I.C. Digestive Health, poorly digested, acidic food may cause abdominal pain as it passes through your digestive tract. Therefore, if you have a history of colon ulcers, the increased acidity of digestive food may worsen your colon problems. The lining of your colon may become damaged if you consume coffee. Specifically, coffee intake may cause inflammation or ulcer formation in the lining of your colon. Inflammation or ulcers can cause abdominal pain and may cause bleeding in your colon. Most doctors advise patients with known disorders, such as Crohn's disease, ulcerative colitis or irritable bowel syndrome, to refrain from drinking coffee because it may worsen symptoms. MayoClinic.com states that two to four cups of coffee per day is safe for most people. However, if you begin drinking coffee and notice mild colon problems, such as diarrhea or stomach pain, you should immediately stop drinking coffee and see your doctor if symptoms do not resolve. 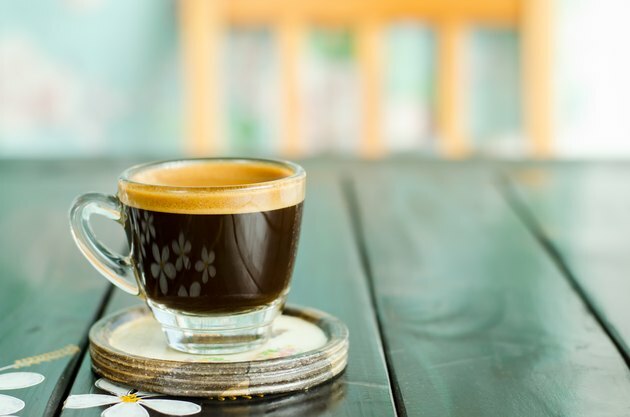 Severe colon problems, such as severe abdominal pain or bloody stools, require immediate discontinuation of coffee intake and medical management.